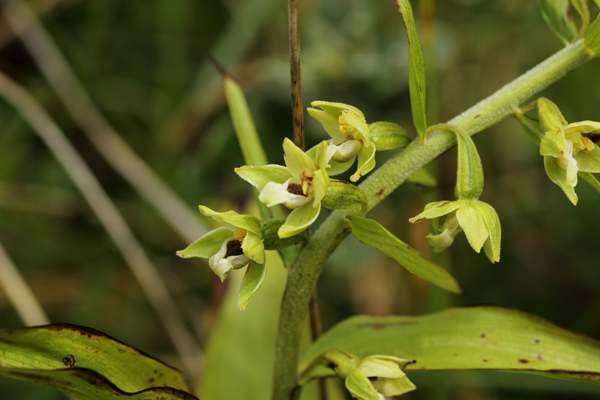 First discovered on Holy Island (Lindisfarne) in 1958, it was at first assumed that these orchids were Dune Helleborines (Epipactis dunensis), but recent genetic studies have shown that they are neither particularly close relatives of the Dune Helleborine nor of its other 'look-alike' the Tyne Helleborine. Lindisfarne is a small island situated off the north eastern coast of England, south of Berwick-upon-Tweed, and is best known for its medieval religious heritage. The famous 16th century castle, priory and visitor centre, along with most of the approximately 160 people who make Lindisfarne their home, are situated in the southern part of the island; but it is to the western part, the so-called Snook, that those who wish to see the Lindisfarne Helleborine should make their way. The island is approached via a causeway and is cut off twice a day by the tide, and so it is advisable to consult a tide table before visiting Lindisfarne. 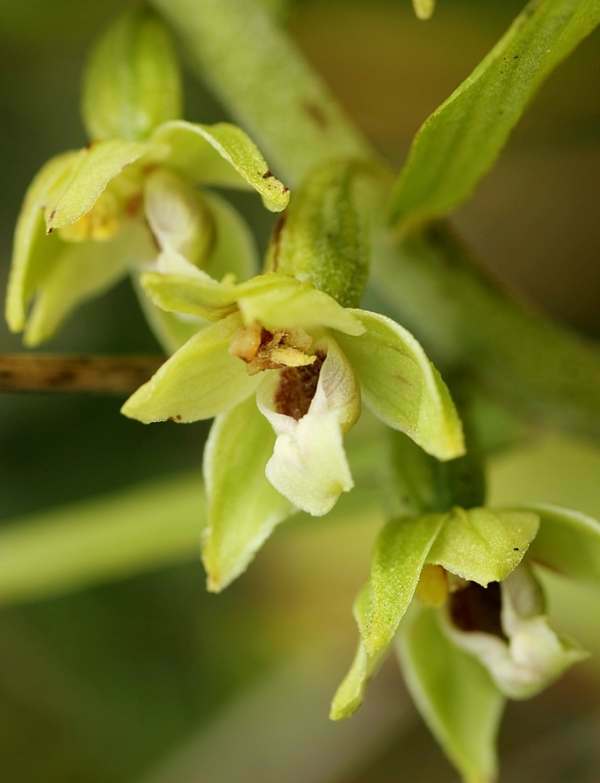 It is said to be the exotic beauty of orchids that ignites the 'orchid fever' experienced by many who become captivated by these fascinating flowers, but the high temperatures produced by Epipactis sancta, an altogether drab and insignificant-looking species, have been created by a protracted and somewhat irritable discussion about its taxonomy. Originally known to us as Epipactis dunensis, this orchid became relegated as a mere 'var.' of Epipactis leptochila (Narrow-lipped Helleborine) - var. dunensis - only to be returned to the dizzy heights of species level a few years later and once more known as Epipactis dunensis. After a subsequent short spell of 'vardom' as Epipactis pietzi var. sancta, in 2002 genetic studies carried out by Squirrell et al finally confirmed that the Lindisfarne plants are sufficiently different to set them apart from other similar-looking species, and they were finally renamed as Epipactis sancta and accorded the even greater glory of being classed as a British endemic. Despite all this I am not sure how expert one would have to be to distinguish Epipactis sancta from either Epipactis dunensis or from the Tyne Helleborine if confronted with all three plants away from their usual geographical locations and particular habitats. The size of the Epipactis sancta plants is variable; they grow to between 15 - 30 cm in height. The leaves are greenish yellow and very obviously veined, and the leaf margins have tiny 'teeth'. Like the Dune Helleborine, Epipactis sancta takes its time to come into flower, and by the time it does so the lower leaves are aged-looking and badly damaged. Flower spikes carry between five and approximately 20 separate flowers, depending on the overall size of the plant. The lips of the small green flowers are white and the hypochiles are dark brown. The Lindisfarne Helleborine flowers from late June to mid-July. It can be found on the western tip of Holy Island where it grows in the dune slacks among creeping willow, marram grass or in bare sand. Because it is self-pollinating the flowering season is short.